Scuba diving seems to be ever increasing in popularity; in the US alone, the estimated number of divers in 2010 was around 2.7-3.5 million (1). As you might expect, a number of our irregular astigmatism patients also want to explore the beautiful underwater world. The question that arises is what contact lenses are safest to use while diving and maintain clear underwater vision? The Diving Alert Network (DAN) recommends daily disposable soft contact lenses as the first choice lens to wear while diving (2). However, a large portion of the patients with irregular astigmatism will not see clearly with soft lenses and need to wear scleral lenses to correct their vision. A number of the patients at Visser Contact Lens Practice have been diving with their scleral lenses and don’t seem to experience any adverse consequences. Moreover, a mini scleral amphibious optics contact lens for diving without a mask has recently been developed (3). A number of factors play a role when diving while wearing scleral lenses, which will be explored here. 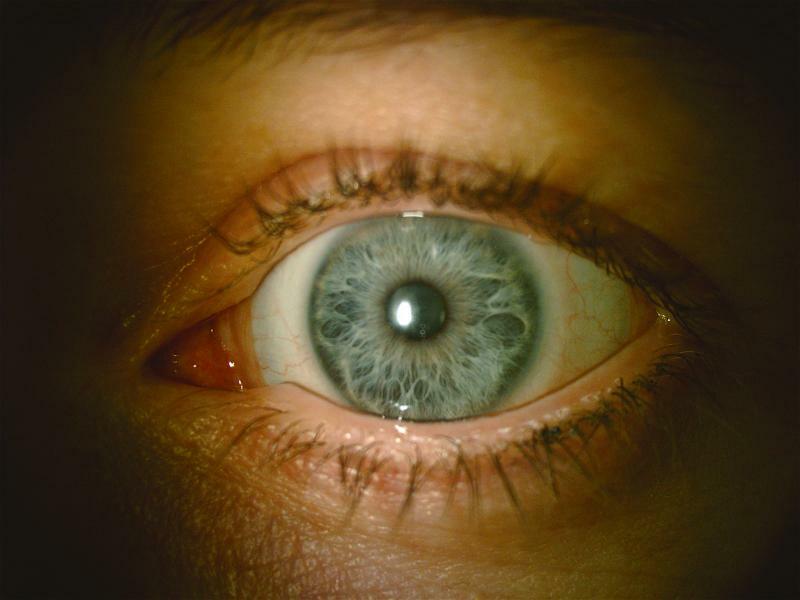 Eye with large diameter scleral lens in place. The pressure increases on descent, causing the air in the body spaces to compress. The air spaces in the ears, mask and lungs become like vacuums as the compressing air creates a negative pressure. On ascent, the reverse happens, and the air spaces become ‘overfull’ with air due to positive pressure. Rigid-gas permeable lenses have been found to occasionally cause uncomfortable or painful eyes and to cause blurred vision during and after dives. 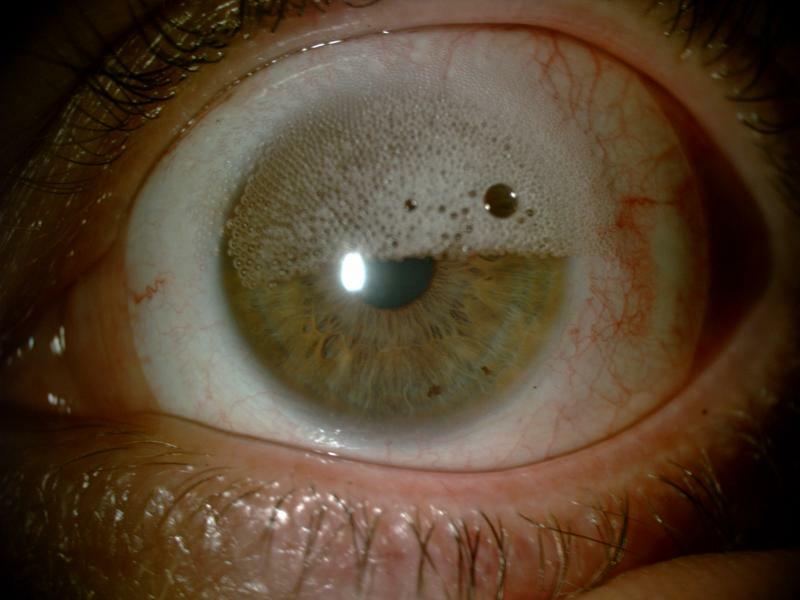 This results from air bubbles (probably of nitrogen) that can form between the cornea and contact lens due to gas escaping the cornea and tear film on ascent (2,4). Blurred vision after diving can also be due to lens displacement while diving or to a too-tight-fitting contact lens after diving (2,4). When wearing a scleral lens while diving, it is important to make sure the lens is correctly in place without any air bubbles trapped beneath. Secondly, it is advised to not apply the lens shortly before diving as it may need at least 30 minutes to settle. When fitting a scleral lens, ensuring that there is good alignment of the landing zone is important. Make sure the landing zone is not too flat, letting air bubbles enter. As the sclera tends to be asymmetric in shape, back surface scleral lenses have been proven to provide a better fit, comfort and increased wearing time (5,6,7). In theory, a scleral lens might offer protection to the eye from mask squeeze when worn during a dive. In mask squeeze, the airspace inside the mask is not correctly equalized on descent, resulting in unequal pressure between the mask air space and vascular pressure within the facial blood vessels, which causes facial barotrauma. Keratoconus patients have historically been advised not to dive due to the risk of mask squeeze on their cornea. However, wearing a scleral lens theoretically may protect the cornea from thinning by mask squeeze (2). Wearing scleral lenses may have a sealing effect. If the landing zone is fitted in alignment, the lens will not displace or fall out of the eye. Due to the above described pressure effects, the lens can possibly fit tighter after diving, and most divers with scleral lenses do mention that their lens feels slightly more tightly fitted on the eye after a dive. This is consistent with reports of Schwiegerling et al., who developed the specialty amphibious mini scleral lenses. These did not dislodge or displace while tested during a dive even when a mask was not worn (4). When diving, lens loss may occur when water would enter the mask, for example, while clearing the mask or when wearing an ill-fitted mask. Awareness of good mask fit and narrowing the palpebral fissure or closing the eyes during clearing can reduce the risk of lens loss. After a dive, special care should be taken regarding lens removal; instilling rewetting drops together with a 15 to 30 minute wait before lens removal is advisable. In all types of contact lens wear, microbial keratitis is a risk particularly when wearing contact lenses in water (8,9). However, it is well established that soft contact lens wear is at a higher risk compared to rigid gas-permeable lens wear (10,11). For the irregular astigmatism patient group, rigid contact lens wear is often the only way to obtain clear vision. Taking the risk of loss and displacement into account, a rigid gas permeable scleral lens might be the safest option. To minimize the infection risk, the scleral lens needs to be removed, cleaned and reinserted with preservative-free saline after the dive. Wearing a contact lens reduces the oxygen transmissibility to the eye. A dive lasts 45 minutes on average, and during the dive, oxygen remains in the diving mask because of oxygen breathed out through the nose. Brown and Siegel (1997) calculate that there is ample oxygen in the mask (3.200 µl) for the corneal requirements in that space of time (4). Whether and how oxygen permeability through the scleral lens to the eye is affected during a dive is not yet clear. In practice, my scleral lens patients have not complained of blurred vision during or after a dive. Generally, more research on diving with scleral lenses is needed to fully establish the risks and benefits of wearing such a lens. However, from our practical experience, scleral lenses seem to be a suitable option for our patients with the correct amount of care taken. 1. Hornsby Models for Estimating the Diver Population of the United States: An Assessment. Archive.rubicon-foundation.org 165-169. 2. Website www.daneurope.org and personal communication. 3. Swieger et al (2013) Improving underwater vision: part 2. Contact Lens Spectrum;28:40-44. 4. Brown MS, Siegel IM (1997) Cornea-contact lens interaction in the aquatic environment. CLAO J;23(4):237-42. 5. Visser ES et al (2007a) Modern scleral lenses part 1;clinical features. Eye & Contact Lens;1,21-5. 6. Visser ES et al (2007b) Modern scleral lenses part 2:patient satisfaction. Eye & Contact Lens;1:21-5. 7. van der Worp E. A guide to scleral lens fitting Version 2. 8. Stapleton et al 2013 the epidemiology of microbial keratitis in silicone hydrogel contact lens wearers. Eye Contact Lens; 39(1):79-85. 9. Lindsay RG et al (2007) Acanthamoeba keratitis and contact lens wear. Clin Exp Optom;90(5):351-60. 10. Stapleton F et al (1993) Risk factors with contact lens related suppurative keratitis. CLAO J;19(4):204-10. 11. Poggio EC et al (1989) The incidence of ulcerative keratitis among users of daily-wear and extended-wear soft contact lenses. N Engl J Med 21;321(12):779-83. Karolien Elving-Kokke graduated with a BSc in optometry in 1997 and an MSc in clinical optometry at the City University in 2005. She has practiced in the UK for 10 years in general and hospital practice. Since 2008, she has worked in the Netherlands for “Visser Contactlenzen” in the contact lens department at the several teaching hospitals. 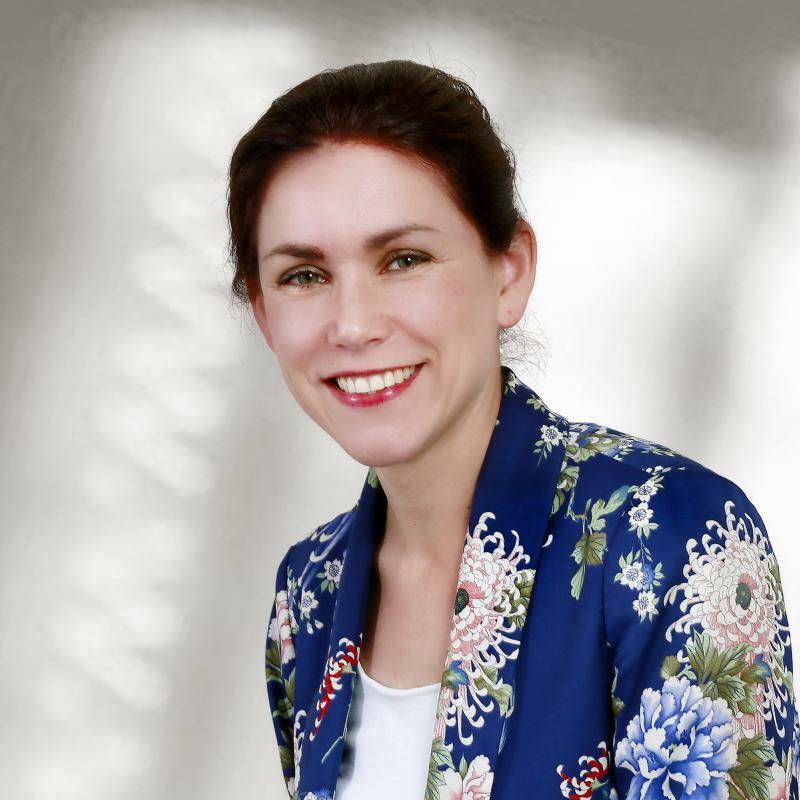 She specializes in medical and scleral lenses and is a member of the ‘Visser scleral lens research and development team.’ She has been an editor of the Dutch optometric journal ‘VISUS’ for six years.